Columbia and Walla Walla Valley! Like salmon spawning up the Columbia River, staff of The Oregon Wine Blog headed northeast this past weekend into the heart of Washington Wine Country. A trip that had been in the planning stages since February and conceptualized months before that, I was pleased to take our group to my hometown and showcase the wine, food, and culture that most certainly didn’t exist there when I was growing up. I’m going to share some overall thoughts on the trip, culinary, and lodging experiences – look for upcoming posts about specific wineries and wines. In terms of dining, we explored Katya’s Bistro and Wine Bar in Richland one evening and had a wonderful experience. A mix of Italian and Greek cuisine with an expansive local wine list, be sure to ask for a seat out on the deck where you can get a sliver of a view of the river nearby. Service was a little awkward; however, we had some delicious food and great wine. I enjoyed one of the specials, fresh coho salmon in a nectarine sauce. The next evening, after a long day of wine tasting, we stopped by Atomic Ale Brewpub and Eatery before hitting the road. The wood-fired, gourmet pizza hit the spot and gave us fuel to finish the day right. Much of our culinary experience in Walla Walla was centered around the farmer’s market that was downtown on Saturday morning. There, we were able to pick up farm-fresh Walla Walla sweet onions, elephant garlic, corn, blackberries, Serrano peppers, and garlic jalepeno focaccia bread. Add some sirloin steak, and we feasted all night with delicious food and wine. For breakfast we tried Merchants, Ltd. downtown and for the most part had a nice meal. When stopping by later in the day, though, to grab a baguette and some cheese to take out to Three Rivers, we were really turned off by the rude manner in which one of the employees told us the kitchen was closed (which apparently means they can’t sell cheese out of the deli case). Yes, we saw the sign – but it doesn’t necessarily require the kitchen to cut off a block of cheese and you didn’t have to be rude! That place is crossed off the list. All in all, an amazing weekend that is indicative of the bounty of the Pacific Northwest. What more can you ask than good friends, food, wine, and great scenery? It was a fairly inexpensive weekend, at least in travel expenses. Wine purchases? That’s a whole different ballgame. Last night, Bob Woodshed of the [BW] Beer Blog and I were putting the final touches on a project that we had been working on, and the completion called for celebration. To the wine rack I went, were our choice was whittled down to three different options -- a Reserve Cabernet Sauvignon from Kiona, a Dolcetto from Erath, and the 2000 Synergy Classic from Cottonwood Canyon. The Synergy hit the spot, so open it became. 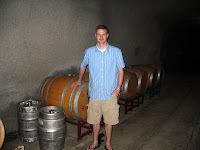 If you recall from a post from some time ago, Cottonwood Canyon Winery is in the Santa Maria Valley AVA (California), and my aunt works there part time so I visited the winery in March of 2007 when I was down in the area. They focus on Chardonnay and Pinot, but put out some bigger red bordeaux varietals as well. The Synergy is a bordeaux blend -- 60% Cabernet Sauvignon and 40% Merlot. Interestingly, by taste I would have sworn there was some Syrah in there but of course then it wouldn't be a true bordeaux blend due to the Rhone origin of the Syrah. According to the winery, the wine had a deep, warm blackberry color, and opened with a nose of pomegranate and smoke. I detected some leather in there as well. Flavors of rich, dark cherries come through in the mid-palate. Soft, smoky tannins and flavors of blackberry, blending into chocolate cherry repeatingly throughout, create the lingering, complex finish. It was very pleasant and very enjoyable for both of us -- thankfully, since Bob mentioned that he wasn't interested in Merlot that evening (and I didn't even think about it until we were well into the wine). Definitely a winner. I'm looking forward to opening the bottle of 1996 Synergy that's on the rack waiting for another special occasion. We rounded out the evening with a Barnard Griffin 2005 Syrah (tulip label), always a standby winner and a great value wine.